Greece practically invented modern civilization. But, in the world of home cinema, the country has been notably behind the technology curve. Until Crystal Audio's SmArt 4 that is: the SmArt 4 is a THX Select speaker system that's as technologically savvy as anything by a British or American company, we're pleased to report. 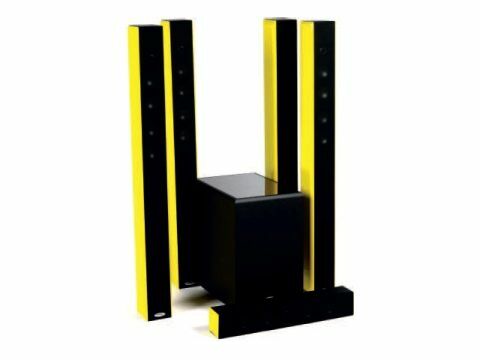 The SmArt 4 system comprises four identical tall, thin floorstanders, a matching centre channel and a powered subwoofer, all THX-Select chummy. In terms of aesthetics, the overall impression is stylish and, well, smart. Part of the appeal is the interchangeable side cheeks on the sides of the five main speakers. But their svelte looks help, with four 75mm aluminium midbass units in place of the usual bigger, wider drivers. A single 25mm high frequency domed drive unit, also made of aluminium, tops off these bass units. The same configuration is used in the centre channel, although in the centre the bass drive units flank either side of the tweeter in what's known as a D'Appolito layout. The only limitation to tall, thin floorstanders is they are very unstable, so Crystal uses a three-component circular baseboard to spread the load. This sits on stick on feet, but spikes would be better. The sub is less of an immediate visual match to the main speakers, but the downward firing, twin ported speaker is still on the elegant side. But as a sonic match, it's much more apt, with the speakers' roll off perfectly blending with the THX Ultra specification upper range of the powered bass speaker. The THX Ultra aspect is often where hi-fi buffs turn their collective noses up at home cinema speakers, suggesting the high crossover point between sub and satellite is audible. But, perhaps this is about execution as much as audio physics, because that crossover is much less noticeable here. We deliberately chose the South Park - Bigger, Longer and Uncut musical DVD, because it's well recorded and both music and dialogue heavy. It's a tough task to replay, especially for a THX Select system, but the SmArt 4 passes with flying colours. Dialogue is clearly differentiated from the orchestra and the surround blends seamlessly with the front 'action'. It's also exciting enough to cope with the 'hell' scenes, yet not so exciting as to make these too over the top. Bass is good and deep if in a small room, but the 250mm driver and 120W amplifier can run out of steam. Overall, the Crystal Audio SmArt 4 is an excellent, well thought out package. Even the manual is brilliantly designed to make set-up easy as possible. It's hard not to be bowled over by this speaker system - it's more of a workhorse than a Trojan horse. The SmArt 4 is a seriously impressive system that gives rivals a run for their money.